‘Bought our second wood stove yesterday. We’d been watching the Craigslist ads for several months looking for a less expensive way to add heat to the basement. Wood stove #1 cost about $3800 to buy, deliver and install and we didn’t want to do that again for wood stove #2. Heating with wood involves a lot of slave labor from our kids. 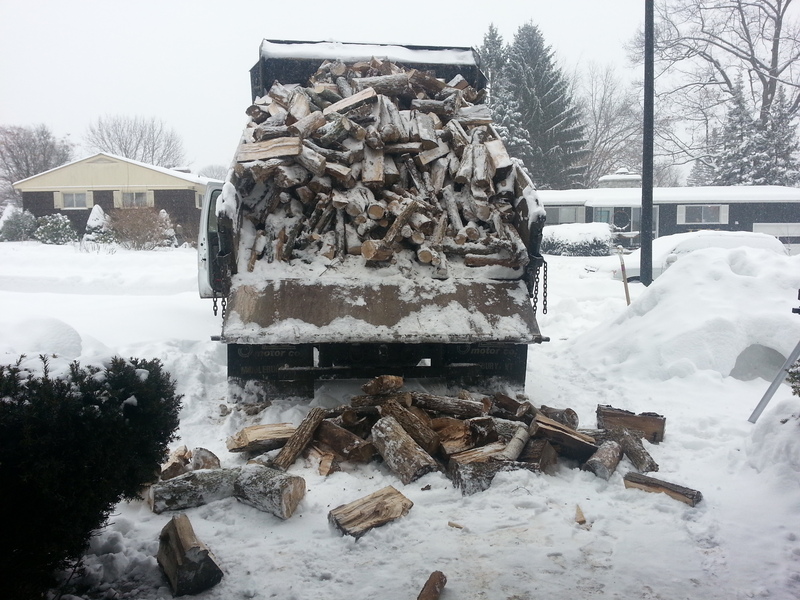 This load of wood arrived snowy, which made our garage wet when we stacked it in there. We had to dry each log in the house for three days before it was ready to burn. Winter is the most expensive time of year to buy cord wood. The problem with buying a used stove is burning wood can be nasty. Wood smoke is no good for human health. We live in a dense urban neighborhood, with elderly neighbors all around and a very busy park right behind the house. Pumping icky wood smoke into the air is inconsiderate, dangerous for our neighbors and downright polluting. But not all wood stoves emit smokey smoke. Starting in 1988 the US Environmental Protection Agency started regulating wood stove emissions. The last update to the regulations, in 1992, required that wood stoves emit no more than 7.5 grams/hour of particulates. 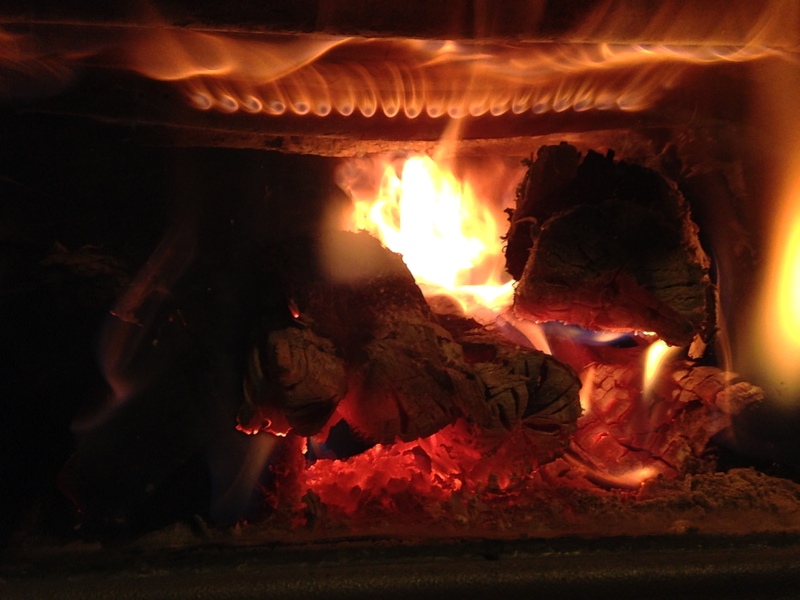 Newer wood stoves are much, much cleaner burning than older stoves, which typically emit 100 grams/hour of particulates. They’re also more fuel efficient. Are wood stoves you find on Craigslist clean burning? We asked a lot of questions of the sellers and looked up the model if the seller could provide that information. Mostly we found that wood stoves in the several-hundred-dollar range were not newer stoves. Lots of them were interesting-looking, but 80- or 100-years old. Some folks were selling newer stoves, but there was generally a scrum among the buyers for those stoves and we never landed one. The type of stove was also a concern. The two clean-burning technologies are catalytic and gasification. I had heard that catalytic combustors need to be replaced periodically, and for the most part people just don’t do it. Any used catalytic stove would likely need a new catalytic combustor and ongoing replacements. The first clean-burning stove I found on Craigslist, the manufacturer said they were no longer making replacement catalytic combustors. If possible, I wanted to avoid a catalytic wood stove. Our wood stove has gasification clean-burning technology. The jets of flame at the top of the image is where secondary air is introduced into the combustion chamber. The secondary air, which is preheated by traveling around the firebox before shooting out the little holes, ignites the particulates and gases in the wood smoke. We get the extra heat from the secondary combustion and the stuff that comes out the top of the chimney is cleaner because the icky stuff has been burned off. We finally found a little wood stove for around $200, made by Vermont Castings. Our chimney sweep told us Vermont Castings stoves could be rebuilt, and that sounded good for a used stove. The seller couldn’t tell us how old the stove was, but the model almost matched up with a newer catalytic stove Vermont Castings is still manufacturing. My cheapskate won out and Nik went off to check out the stove with instructions that he should buy it as long as it looked ok. The price was just too good to pass up. The good news: it was so small, and disassembled so easily, that Nik and I were able to get it down to the basement ourselves. The bad news: neither of us could find a catalytic combustor anywhere inside there. Based on the condition of the exterior I think it’s probably a 40-year old stove: definitely not clean-burning. It’s been sitting in pieces in the basement for about a month. We haven’t yet had the chimney lined for a wood stove (we’re using the flue that the oil furnace used to vent into), so we’ve just been ignoring the sad little thing. This week our chimney sweep (Brickliners; we like their service and recommend them to folks in the area) called to schedule the installation of the liner in the old oil furnace flue. That got us motivated to figure this wood stove thing out. Since we bought the little dirty stove Nik and I had both decided we didn’t really want to use it here. In the meantime one of Nik’s friends told us he bought a used wood stove at the shop where we bought our new wood stove a year ago. Buying a used stove from a dealer! Liiight buulB! At our wood stove shop we looked at an $800 wood stove that the salesperson called a “creosote machine”: definitely not the one for us. He walked us through all the different stove styles and when he got to the least expensive ones they sell he said, “We got one of these on trade in yesterday. I’ll see if we still have it in the warehouse.” It’s lined with refractory brick, which I like for no good reason, is a gasification-type late model stove, has a neat smoke bypass that keeps smoke from spilling out when you open the door to load, takes the same size wood our other wood stove uses, and they’ll check out the whole thing and guarantee that everything works well. Yes! $1200, plus they’ll deliver it for $150 – a steal considering thing has to go down the basement stairs. All told, more than we had planned to spend, but I’m really glad we’re having the stove checked out by a factory rep. Still to work out: single-wall or double-wall pipe for the chimney connector. This will determine how much clearance we need to leave behind the stove. Why a wood stove in the basement when we already have a wood stove upstairs? With the heat pump water heater downstairs we have what amounts to an air conditioner in the basement. In the winter the basement gets really cold, and that in turn hurts the efficiency of the water heater. If we play it right, we could probably double the wintertime efficiency of the water heater (cut in half the electricity for hot water) by keeping the basement warm with the wood stove. So, will we have electric hot water or wood-fired hot water? A hybrid! And to top it off, the game room in the basement will be warmer, and the floors upstairs will be warmer. I love that you & Nik are always coming up with new ideas. What will you do with the little stove? Put it on craigslist? Little stove for sale. Name your price. You pick up.